For business or pleasure, this high-quality and easy-to-use WXGA , 3.300 -lumen Business projector works equally well at education environments or in the Meeting room . An 1080p , 3.600 Lumens DLP Business Projector with a vast range of adjustment, and BrightEra for higher quality colour and a longer lifespan. 3,300 lumens of high brightness provide comfortable lights-on presentations in well-lit meeting rooms to promote discussion, collaboration, and note-taking. The high luminance boosts picture quality with vibrant color for pictures and videos as well as crisp text and fine details. Powerful 15,000:1 native contrast enabled by state-of-the-art DLP technology and all-glass optical lens systems deliver ultimate clarity, smooth gradational mid-tone color transitions, and razor-sharp readability for compelling corporate visual communication. Dual HDMI inputs in addition to dual VGA inputs are purpose-engineered to host multiple presenters and their laptops or mobile devices without a second thought. Multiple inputs enable meeting participants, teachers, and students to collaborate instantly without complicated adapters or time-consuming IT support. Far superior to projectors with only one adjustment foot, the triple adjustment feet significantly enhance flexibility in a wide variety of meeting rooms, with the additional feet placed at the corners or the projector to facilitate easy movement. A sleek, compact industrial design with a sculpture patterned cabinet resists dirt and fingerprints as the projector is moved from one room to another, along with new intuitive keypad and remote control layout to simplify picture adjustment to the new room. 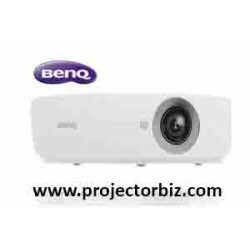 You can buy BenQ MH534 online in Malaysia on www.projectorbiz.com, the best price and after sales services.